Dr. Victor Chang is a Senior Lecturer in the School of Computing, Creative Technologies at Leeds Beckett University, UK and a visiting Researcher at the University of Southampton, UK. He is an expert on Cloud Computing and Big Data in both academia and industry with extensive experience in related areas since 1998. Dr Chang completed a PGCert (Higher Education) and PhD (Computer Science) within four years while working full-time. He has over 70 peer-reviewed published papers. He won £20,000 funding in 2001 and £81,000 funding in 2009. He was involved in part of the £6.5 million project in 2004, part of the £5.6 million project in 2006 and part of a £300,000 project in 2013. Dr Chang won a 2011 European Identity Award in Cloud Migration. He was selected to present his research in the House of Commons in 2011 and won the best student paper in CLOSER 2012. He has demonstrated Storage as a Service, Health Informatics as a Service, Financial Software as a Service, Education as a Service, Big Data Processing as a Service, Integration as a Service, Security as a Service, Social Network as a Service, Data Visualization as a Service (Weather Science) and Consulting as Service in Cloud Computing and Big Data services in both of his practitioner and academic experience. His proposed frameworks have been adopted by several organizations. He is the founding chair of international workshops in Emerging Software as a Service and Analytics and Enterprise Security. He is a joint Editor-in-Chief (EIC) in International Journal of Organizational and Collective Intelligence and a founding EIC in Open Journal of Big Data. He is the Editor of a highly prestigious journal, Future Generation Computer Systems (FGCS). He is a reviewer of numerous well-known journals. He has 27 certifications with 97% on average. He is a keynote speaker of CLOSER/WEBIST/ICT4AgeingWell 2015. Dr Chang has published two books on Cloud Computing which are available on Amazon website. Muthu Ramachandran is currently a Principal Lecturer in the Computing, Creative Technologies, and Engineering School as part of the Faculty of Arts, Environment and Technology at Leeds Beckett University in the UK. Previously, he spent nearly eight years in industrial research (Philips Research Labs and Volantis Systems Ltd, Surrey, UK) where he worked on software architecture, reuse, and testing. His first career started as a research scientist where he worked on real-time systems development projects. He is an author & co-author of books: Software Components: Guidelines and Applications (Nova Publishers, NY, USA, 2008) and Software Security Engineering: Design and Applications (Nova Publishers, NY, USA, 2011). He has also widely authored published journal articles, book chapters and conferences materials on various advanced topics in software engineering and education. He is a member of various professional organizations and computer societies: IEEE, ACM, Fellow of BCS, and Fellow of HEA. He is also invited speaker on several international conferences. He had worked on several research projects including all aspects of software engineering, SPI for SMEs (known as a Prism model), emergency and disaster management systems, software components and architectures, good practice guidelines on software developments, software security engineering, and cloud computing. Dr Gary Wills is an Associate Professor in Computer Science at the University of Southampton. He graduated from the University of Southampton with an Honours degree in Electromechanical Engineering, and then a PhD in Industrial Hypermedia systems. He is a Chartered Engineer, a member of the Institute of Engineering Technology and a Principal Fellow of the Higher Educational Academy. He is also an adjunct professor at the Cape Peninsular University of Technology and a research professor at RLabs. Gary's research projects focus on System Engineering and applications for industry, medicine and education, see research pages for more information. Dr Robert John Walters is an Assistant Professor in Computer Science at the University of Southampton. His research interests include middleware, distributed computing, hypermedia and graphical formal modelling language. Related Experiences: Dr Robert John Walters is supervising a few PhD students specialising in Cloud Computing. Dr Verena Kantere is a Senior Researcher and an Excellence Grant Scholar based at the University of Geneva. She has won prestigious funded projects, including FP7-ICT-2013 Specific Targeted Research Projects (STReP) and the Swiss National Science Foundation (SNSF) Project. She has a wide range of research interests in Big Data, Cloud Computing, P2P systems, Semantic Web, Distributed Systems and Databases. Dr. Chung-Sheng Li is currently the director of the Commercial Systems Department, PI for the IBM Research Cloud Initiatives, and the executive sponsor of the Security 2.0 strategic initiative. He has been with IBM T.J. Watson Research Center since May 1990. His research interests include cloud computing, security and compliance, digital library and multimedia databases, knowledge discovery and data mining, and data center networking. He has authored or coauthored more than 130 journal and conference papers and received the best paper award from IEEE Transactions on Multimedia in 2003. He is both a member of IBM Academy of Technology and a Fellow of the IEEE. He received BSEE from National Taiwan University, Taiwan, R.O.C., in 1984, and the MS and PhD degrees in electrical engineering and computer science from the University of California, Berkeley, in 1989 and 1991, respectively. The focus of this workshop is to demonstrate new techniques, demonstrations and innovative approaches in ESaaSA and analytics services. The impacts of research contributions are as follows. - Explain how to implement analytics, and their added values. - Demonstrate how ESaaSA can be used in different case studies. - Describe how to resolve challenges in each Cloud Computing adoption scenario. Luís Veiga received his PhD (2007) in Computer Science and Engineering, by Instituto Superior Técnico (IST), ULisboa. He is tenured Assistant Professor at IST and Senior Researcher at INESC-ID. He coordinates locally the FP7 CloudForEurope project, participates in FP7 Timbus project. He has lead 2 National research projects on P2P cycle-sharing, and is locally coordinating 2 on distributed virtual machines and multicore programming. His research interests include distributed systems, replication, virtual machines, middleware for cloud, grid, P2P and mobile computing, resource management. He has over 70 peer-reviewed scientific publications (Best-paper at Middleware 2007, Best-paper award runner up at IEEE CloudCom 2013) in workshops, conferences, book chapters, edited books, and journals since 2000. He was General Chair for Middleware 2011, and belongs to Middleware Steering and Program Committee. He is Virtualization track co-Chair for IEEE CloudCOM 2013, and Local Chair for Euro-Par 2014 track on Distributed Systems and Algorithms. He has served as reviewer for prestigious journals such as IEEE TPDS, JPDC, FGCS, IEEE Systems Journal and served as Guest-Editor for two special issues of Springer JISA journal. He has previously served in international conferences as member of program committee, proceedings editor (ACM Middleware 2012, EuroSys 2007, ACM PPPJ 2007-2008, and MobMid/M-MPAC Workshop at ACM Middleware 2008, 2009, and 2010) and co-chaired ARM Middleware workshops for 2012 and 2013. He was an "Excellence in Teaching in IST" mention recipient (2008, 2012), and awarded Best Young Researcher at INESC-ID Prize (2012, and nominated 2010,2011), and nominated for Best Researcher at INESC-ID Prize (2013) overall. He is a member of IEEE, ACM and EuroSys. He is a member of the Scientific Board of the MSc in Telecommunications and Informatics, and an elected member of the IST School Assembly. ESaaSA is a leading workshop in Emerging Services on Cloud Computing and Big Data. Authors for our selected workshop papers have the proofs-of-concepts and demonstrations that have offered research and/or enterprise contributions. To help us running an international workshop bringing experts, scientists and practitioners of different domains and specialisation together, we actively seek sponsors who can support our scholarly activities. We will issue certificates of participation and certificates for the best paper, runners-up and third-place papers. Your logo will appear on the certificates given to all the delegates and appear on our website and our materials for ESaaSA 2015 public relations. Diamond Sponsorship: 2,200 Euro or £1,700, a free registration and a free conference dinner for one person, as well as promotion of your events and services at the workshop and conference. A business keynote presentation will be included. Your logo will be on all the certificates issued to delegates. Gold Sponsorship: 1,300 Euro or £1,000, a free registration for one person. A sponsor keynote presentation will be included. Your logo on all the certificates issued to delegates. Silver Sponsorship: 550 Euro or £420, a free conference dinner for one person. Your logo will be on all the certificates issued to delegates. Bronze Sponsorship: 325 Euro or £250. Your logo on all the certificates issued to delegates. Extended versions of selected papers will be published in a special issue of RonPub's Open Journal of Big Data (OJBD) edited by the workshop chairs. 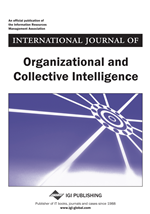 We sincerely invite all conference delegates to consider submitting an extended version of their papers to our journal, International Journal of Organizational and Collective Intelligence (IJOCI), on special issue on Emerging Clouds. You need about 40-50% of new content based on the extension of your conference/workshop paper. Details will be given during the workshop and conference period. ESaaSA has a social network website on Facebook.